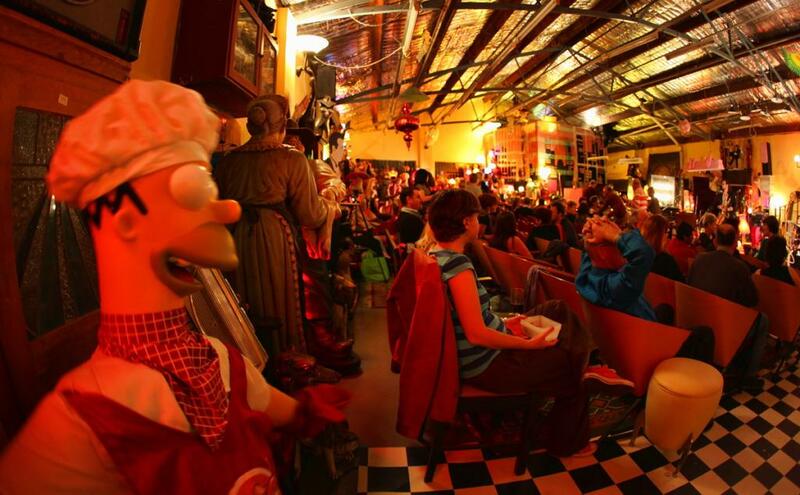 "The most romantic, cosy, comfortable and fashionable venue in Australia; a warehouse space that looks like a cross between Wonderland and Austen Powers’ dream dwelling. Cosy couch corners everywhere with plush velvet upholstery, eccentric decorations from Monsieur Camembert’s collection of designer and retro bric a brac, and a surprisingly high tech edge. When I saw the place I was amazed and just had to perform there. It’s honestly not a venue, it’s a fantasy. It will not disappoint. …The sound and atmosphere reminds me of all the things we love and miss about Europe. It’s got loads of atmosphere, warmth, eccentricity, with touches of bizarre and offbeat humour everywhere, (You'll see what I mean) And being there gives you the feeling of being part of something truly special and rare. So, I can’t wait for us to perform at the Warehouse and feel so lucky to be able to perform there, in a place that feels like romance itself..."